This will continue our review of the positions of the City Council candidates for the 33rd and 39th Districts on the subject of development and Atlantic Yards in particular. 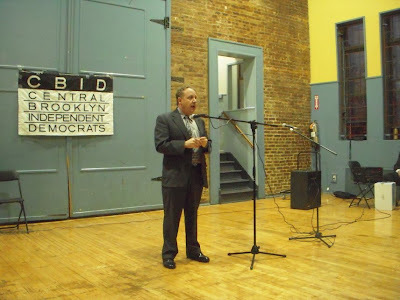 In all, looking at all the candidates’ positions together with the positions of the two City Councilman (David Yassky and Bill de Blasio) they will replace (who are running for other offices, Comptroller and Public Advocate), we are inventorying the position of a total of 15 candidates who all express opposition to Atlantic Yards. We are asking, as the acid test, how such opposition will translate into effective action to stop the Atlantic Yards project if these candidates are given the powers of elected office. Part I of this series reviewed the surpassing importance of city development issues in the City Council races and the way these issues are being reported upon in the race. Part II of the series inventoried the positions of the candidates for the 33rd District and focused on the question of what “effective action” to stop Atlantic Yards entails. Here to conclude our series, here are the stated positions of the candidates for the 39th City Council seat together with such commentary of our own as we deem appropriate. A) My position has not changed. That area is sorely in need of development, but we need to ensure that affordable housing is priority one. I don’t agree with the use of eminent domain for private residential development, but I do consider the Arena a public good, which limited use of eminent domain may be used to accomplish. B) Now that the Carroll Gardens contextual rezoning appears to be going through, we need to focus on what’s best for the Gowanus Canal, in addition to fighting for affordable housing at the Atlantic Yards. We found Mr. Heyer’s written statement of his position the most ambiguous and difficult to interpret. We therefore called him up for clarification. (Ambiguous statements from politicians in the context of Atlantic Yards can be treacherous and can leave one feeling betrayed when desired change does not materialize.) It turns out that Mr. Heyer expresses a more thoroughgoing opposition to Atlantic yards than one might suspect from reading the above. Mr. Heyer has been described as a protege of the very politically active Buddy Scotto, for whose funeral business he works. Mr. Scotto and his daughter are also very active in local Carroll Gardens/Gowanus real estate ownership and development. Mr. Scotto is strenuously opposing a more thorough clean-up of the Gowanus Canal through a federal superfunding of the canal. Mr. Heyer, who has two jobs, also works in a full-time (35 hours a week) position as an assistant to Brooklyn Borough President Marty Markowitz, one of Atlantic Yards’ most notorious and ceaseless boosters (also a recipient of developer funds). Taking advantage of flex-time Heyer is able to take mornings off to earn $10,000 a year from his funeral director activities. He is also a small business owner, married, having a baby and buying a new home. Here is what more we learned by talking to Mr. Heyer’s about his position on Atlantic Yards. While he thinks that eminent domain can be properly used to acquire land for the arena, he does not think it should be used for the rest of the project, such as for the block where the Ward Bakery Building was. Though Pacific Street has to be closed between the two blocks where the arena would go, Mr. Heyer is against the unnecessary closing of Pacific Street and Sixth Avenue. He said that the street grid provides the desirable “look and feel of our city.” He recognizes that without the superblocking involved with closing the streets, the project would need to be cut back and be less dense, but he is in favor of a smaller, less dense project anyway. While he is in favor of the arena, he is against the public taxpayer funding of the arena that has been proposed. That funding and the foot-in-the-door aspect of the developer’s getting a monopoly on 30+ acres of real estate is pretty much the developer’s profit-motivated raison d’etre for the project. Accordingly, without it, the Ratner project would probably be dead. Mr. Heyer was not familiar with the UNITY Plan’s proposal to add additional streets to the site but said he favored a street grid to avoid fostering a sense of “private communities” something for which the Atlantic Yards design has been criticized, and that city streets should be favored to create the feeling of bringing people into an area. Mr Heyer objected to the density of the project, rejecting idea that an “entire metropolis” should be squeezed into a few square blocks. As Mr. Heyer questionnaire says, he is a proponent of creating affordable housing, we asked him if he was in favor of taking the project away from Forest City Ratner in order to bid parcels out to get maximum value from the subsidies. He said he was unsure about taking from Ratner any parcels Ratner already owns, whether or not those parcels were acquired through the threat of eminent domain. 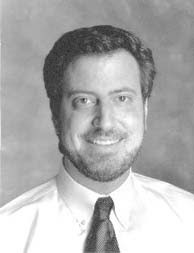 Although Mr. Heyer was receptive to the principle of bidding out project development where possible, he wasn’t sure what Forest City Ratner simply already had the right to do. He said he felt that where property is not already owned by Ratner subsidy should be made available for development by other owners. 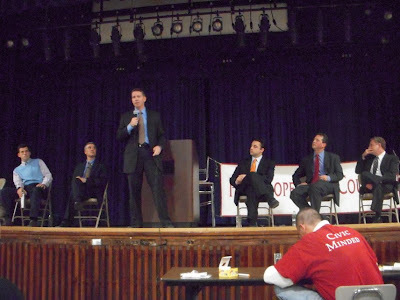 When we pointed out that Ratner did not have an as-of-right expectation for the coming upzoning being provided by the Empire State Development Corporation’s zoning override, Mr. Heyer said that it was a problem that this was being done through the state rather than being done though a public process where the community would be able negotiate for what it wanted. We pointed out that Governor Paterson could put a halt to the project and take it back to the drawing board. We asked Mr. Heyer about ESDC’s blight finding. He said that there were properties in the area that were definitely not blighted, but that he didn’t know enough about the site to be able to say although he thought that 20 years back there was definitely blight in the area. At the same time he said that when the Ward Bakery building was in use there wasn’t blight. This could be taken as another clear example that the MTA just has bad business dealings. How can we continue to trust this organization, the MTA when they’re constantly. . . They are supposed to be serving the public and I have yet to see that happen. It is complete mismanagement, everywhere. Would you, personally, if you are looking to pay your payroll . . sell your car for less money? I don’t get it! It just seems like bad business to me. I don’t trust or believe anything the MTA, does. 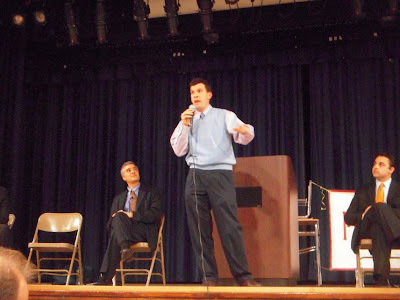 I asked Mr. Heyer about calling a moratorium on the doling out of benefits for the project as others have called for. Mr. Heyer said Forest City Ratner should not receive any special benefits, only what others would be able to receive. (We think that would kill the project. We were not sure Mr. Heyer considered that to be the case.) Mr. Heyer, however, said that he did not think it was proper to keep the project “the way it is now” or “the way it was originally proposed” by Ratner. Listen it’s great when you have a community like Brooklyn and it is able to form a group like, for instance, Develop Don’t Destroy because that’s how we wind up trying to get the best project possible for Brooklyn. Otherwise people would come in and they would run all over us. We need to have these conversations. Finishing up, Mr. Heyer said that we had asked him some questions during the interview that caused him to think about some things he had not previously thought about.- The questions we were asking Mr. Heyer pretty much follow the outline of Atlantic Yards “inherent subquestions” we set forth at the beginning of Part II of this piece, which we suggested should be borne in mind when reviewing all the candidates’ positions. Probably all the candidates and all current political officeholders should be asked these questions. We found our conversation with Mr. Heyer very interesting. The one thing that bothered us though was that he is apparently willing to let Forest City Ratner get permanent benefits from its acquisition of property through the threat of eminent domain. We think that Forest City Ratner has done the community many wrongs, including its vandalous destruction of the Ward Bakery. We think that being too casual about allowing the Ratner organization to benefit from those past wrongs would be to encourage the same sort of wrongs in the future. 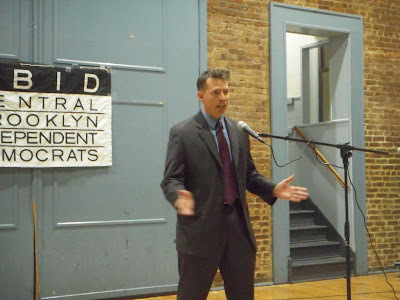 We talked with Mr. Heyer again after the Tuesday evening candidates forum where candidate Brad Lander (answering a classic question) expressed strong opposition to Atlantic Yards. We asked Mr. Heyer whether he agreed with Mr. Lander which he said he essentially did. For more, see our coverage of Brad Lander’s position below. In 2005, I co-authored a highly critical “preliminary planning assessment”of Atlantic Yards (http://www.prattcenter.net/pubs/bay-report.pdf), which criticized the project for excessive public subsidies, misleading cost benefit analysis, excessive scale, inadequate traffic and infrastructure plan, etc. I remain opposed to the project. I helped lead the successful effort to insure that Atlantic Yards would not receive an additional $200 million tax subsidy under the 421-a tax exemption. Because I am opposed to the project, I am opposed to the use of eminent domain to construct it. My campaign conducted a survey of over 300 community residents. 74% want any new development built by responsible contractors, to include affordable housing, be environmentally sustainable, and fit contextually into the neighborhood. 23% say they have had enough development and don’t want any more. I have a strong record of results, both in our community and citywide, fighting for requirements that any new development include affordable housing, be built by responsible contractors, address infrastructure and environmental issues, and strengthen neighborhoods. Positions on a range of specific development issues facing the 39th City Council district (including the Gowanus Canal area, the Stable Brooklyn & Carroll Gardens rezonings, etc. ), and on citywide development policies (to give communities a real voice in a comprehensive planning process, insure that infrastructure issues are addressed, guarantee responsible contracting, etc.) are on my website. We totally cleaned up the New York State Housing Finance Agency which under the Pataki administration had become a corrupt candy store. Although the Mr. Lander’s questionnaire response says that Mr. Lander is not accepting contributions from “developers” we clarified (with a question we asked at the CBID evening on the 23rd) that he does accept contributions from nonprofit developers. There may be some qualitative differences but there are overlapping issues. ACORN has a nonprofit development arm and Domino is being developed by a developer who has both a for-profit and a nonprofit arm. What Brooklyn project is the biggest boondoggle and the most destructive to the borough and the city and what effective action would you take to stop it? I’ll take Brooklyn Atlantic Yards for 500! Or $5 billion I guess, or whatever the total cost of the project is. I think its pretty straightforward. It was so badly planned that it is essentially collapsing under its own weight and hopefully we will have a chance to do the right thing, but I don’t know. Isabel Hill is in the audience. She made the fantastic film, Brooklyn Matters. If you want to know what is wrong with that project you should ask her for a copy. You know, from start to end that project was oversubsidzed and didn’t respect its residents. It was wildly out of scale. Its urban design: private parks as a playground for condo owners. You know it’s wrong in every way. So I certainly would be happy to see it fail. I think the question facing us, is what to do about it given that the ESDC and the MTA have given them essentially ten years of rights to waste the land, how are we going to wrest control back. I think that’s going to mean working with a lot of other elected officials to try to put pressure on so we can do the right thing there because we don’t want this gargantuan albatross. Going back to Mr. Heyer: Mr Heyer told us that he agreed with Mr. Lander that Atlantic Yards, were it to be built, was the worst boondoggle, particularly as originally proposed, but only provided it was actually built. He said that unless and until it was built he would save that honor for bad development that had actually materialized such as building on Fourth Avenue pursuant to the recent rezoning. Yes, I do endorse his answer. I think we have to figure out how to retake over that space. I mean, frankly, what’s the project right now? It’s totally unclear to me. So the question is. . and also I think we’ve got to look at the agreement about the city money that went in there, all this capital money going in there and there was some claw back provision if they didn’t provide the affordable housing in a certain period of time so we could recoup some of the city’s capital money so we have to go back and really look at the details of that agreement and see what options the city has. . . . That agreement needs to put on the table and looked at. I haven’t heard people talking about that. . . . That $200 million in capital money that was pumped into that project, that money is now nowhere! So yeah, I think we have to figure out how to go back and reclaim that space and do something good with it. My position has not changed: against. I am against government funding for sports arenas generally, and against this type of clubby development process as well. I do not believe this was an appropriate use of eminent domain. I am in favor of decking over the Vanderbilt yards for development, but utterly opposed to both this project and the process. Overdevelopment is a serious issue throughout the district; besides damage to existing communities, scattershot development patterns undermine the goals of concentrated development in, for example, the Downtown core. Absolutely. Yes. I don’t think there is anything that comes close in recent times from the process that it went through to the sweetheart deal with a major developer to the superblock, you know which has been discredited, to using public money for a sports arena, which are all things which are just execrable at the planning level, to eminent domain. Kelo case drew the line in the wrong place.) One question is how soon the court may be ready to grant certiori to such a case. It is worth noting that with the retirement of Justice David Souter that day may come sooner and with it we may also see retrenchment from the Kelo ruling itself. 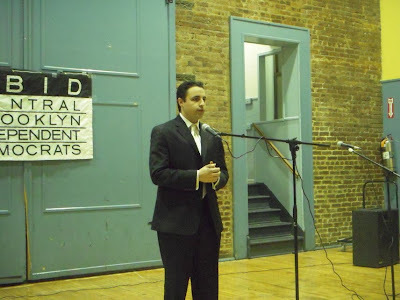 I have opposed the Atlantic Yards project from the beginning and my position has not changed. I have worked with Develop Don’t Destroy Brooklyn for the last five years. I think Atlantic Yards stands as the poster child of bad development for many reasons -- including the use of public funds going to private developers, the abuse of eminent domain, the exclusion of community input at every level, the dismissal of any reasonable options or modifications, the selling of public land at below market-rate prices, etc. I am not afraid to lead on development issues. That’s why my name appears alongside CBID’s on the environmental lawsuit brought by Develop Don’t Destroy Brooklyn. 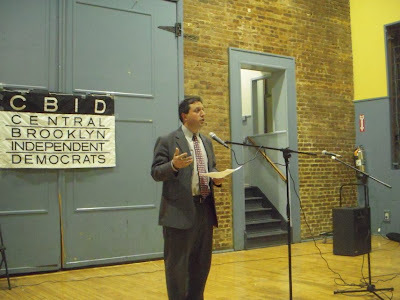 Responsible development of the Gowanus Canal is an important issue in the 39th District. I have always held that the canal and nearby brownfields should be cleaned up and deemed safe before any development is approved. We simply cannot risk that people will become ill from the toxins present in the water and the land. Accordingly, I support the designation of the canal and nearby brownfields as an EPA Superfund site. We have a golden opportunity to do this development the right way. It will not be quick, but the clean up will provide jobs and will ensure both that property values will go up in the long run and that the Gowanus area will prosper in the future. We will note that Mr. Skaller was the only candidate present at a City Hall News breakfast event to confront ESDC head Marisa Lago with a question about whether Atlantic Yards should be continuing at this point. (See: Wednesday, April 15, 2009, Permission to Speak Frankly: How We Know More and Less From Breakfast Interviews With Marisa Lago.) 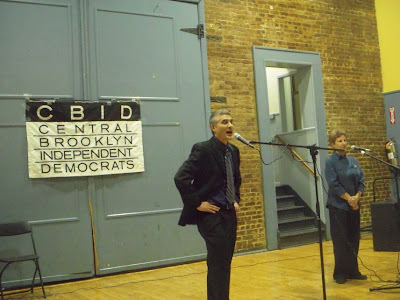 Note that on the evening of April 23rd CBID endorsed Mr. Skaller. Mr. Skaller also related the struggles of mom-and-pop stores to the competition from big, subsidized projects like Atlantic Yards. This we thought was a better answer than that given by Brad Lander who expressed willingness to institute commercial rent regulation, admittedly a longshot. The idea of commercial rent regulation scares us, as does the idea of more direct forms of subsidized supposed support for mom-and-pop stores. We don’t think the answer is to subsidize these small businesses to compete with subsidized developments and big stores. We think the answer, before anything else, is to cut out the subsidies to the big stores and developments that drive the mom-and-pops out of business. I was, continue to be, and will remain opposed to Atlantic Yards. It is a project that is way out of scale for the neighborhood, and the one good thing to come from this recession is that it will hopefully result in the project’s demise. It is not an appropriate use of eminent domain. As for other development issues, we need to ensure that future development is contextual and at an appropriate scale, and we must move towards building green. I have been against it from the very beginning. I wrote a letter to. . I was on the community board at the time, but I wrote a letter to the Empire State Development Corporation, which you can Google Bob Zukerman and Atlantic Yards and you will see all my criticisms of the project. So I am very much against it, always have been and continue to be so. Googling, we found Mr. Zuckerman’s September 29, 2006 letter. It is a good start but we think he is going to have to write something stronger to get the point across with the people at ESDC, who are not very attuned to listening to community criticism of a developer’s project. Here’s my relationship. Buddy is on the board of the Gowanus Canal Community Development Corporation of which I was most recently Executive Director. I’ve taken a leave of absence. I’m now on leave to run full time for City Council. He’s one of many board members. Buddy is actually not supporting me in this race. He’s supporting John Heyer. I think that’s enough on that, right? Mr. Heyer is the only candidate opposing superfunding of the canal. All the other candidates support its superfunding. Here, for reference from the same CBID questionnaire is the postion of Bill de Blasio, the current City Councilman for the 39th. Mr. de Blasio is currently running for the office of Public Advocate. Given that we thought that Mr. de Blasio’s statement was one of the weakest statements in opposition to the project, we asked Mr. de Blasio’s office whether they would like to provide a supplement further fleshing out his position. They have not, so far, responded. We feel it will be appropriate to review in a future piece the possible importance that the Public Advocate’s opposition to Atlantic Yard may have in stopping the project. "I am livid at the New York Times interview with Ratner" in which the developer announced that the project would be scaled back and that massive amounts of affordable housing would be seriously delayed or eliminated. "There was no discussion with the community before he went on record," Mr. de Blasio said, adding that the changes put "the entire community benefits agreement up for question." Last night, Mr. de Blasio said he supports "a moratorium on demolition until there is a written plan" that "confirms what will be built when and confirms affordability" and that he "can't support" an arena-only plan. The Councilman also said that he thinks the entire development should be reviewed again by the state if Forest City Ratner is now conceiving of a vastly different project, particularly one that reneges on its promised affordable housing. "I held out hope for the project because of the amount of affordable housing it would create, as well as the number of jobs it would bring," he said. "But I have been constantly disappointed in the lack of community involvement...I've never seen anything that's been mismanaged so fundamentally in terms of community involvement." Where Is the Effective Action the Community Deserves to Stop Atlantic Yards and Which Would Be Consistent with Elected Officials’ Opposition to the Preject? So we have got to ask: Where is the moratorium? Why does ESDC keep working on this project even as it becomes recognized as increasingly alien to the public benefit or even those benefits that were originally elusively and deceptively promised? Bill de Blasio is a very bright, capable and influential City Councilman seeking higher office. Why has he not been effective in opposing a project so unjustifiable and so universally despised? And here is the trap to avoid. If Mr. de Blasio gives lip service to opposing the project like almost every other politician, how do we know that those seeking to take his City Council seat will not be similarly ineffective? As we look at the candidates, that is what we are trying to discern. We have at least one starter suggestion. This is a project that continues even though it has no visible means of support. The governor has never said one public word in support of the project. Even the mayor, key to the project’s survival as he is (and as seemingly assured of reelection by his billions), avoids public statements of support for the project. The mayor avoids even mentioning Atlantic Yards and we think his plan of preference if for it to play political possum until he has procured his desired third term. Governor Paterson, (to whom the mayor has not been kind) could certainly prevent that. How?